In their fifth and by far most cruel attack on Almaguer, communist guerrillas recently devastated this little town which clings to the Andes in the province of Cauca in southeast Colombia. The guerrillas burst open the doors of the Catholic Church and placed dynamite charges under the altar, church and rectory. The charges went off, reducing the church and many of the surrounding houses to ruins. statues of the Blessed Mother venerated in Colombia. When the attack was over, the afflicted and defenseless inhabitants ran to the ruins of the church, only to confirm that the ancient wooden altar, brought by the Spaniards four centuries ago, was completely destroyed, together with the tabernacle and the Blessed Sacrament. However, to their astonishment, the villagers found that the most illustrious and oldest “inhabitant” of the town was unharmed. The pious statue of the Virgin of the Miracles, the town’s patroness, was entirely intact amid the rubble. Many of the villagers wept with emotion in contemplating a scene that called to mind the Passion on Calvary. At the height of the power of darkness, Our Lord Jesus Christ allowed that all be done against Him, yet permitted no one to touch His most Holy Mother, who together with the holy women, stood at the foot of the cross with Him. The Faith of the people of Almaguer, tempered by adversity and confirmed by this supernatural episode, made them overcome the attack which took place last March 31. With renewed ardor, they embarked upon reconstructing the town and are now preparing to celebrate the 450th anniversary of its founding on August 19, 1551. In a certain sense, the Way of the Cross suffered by the town of Almaguer is an image of what is happening all over Colombia. The nation is lacerated by the cruel acts of the communist narco-guerrillas, who, true to their Marxist creed, persecute the True Faith. The “miracle” of Almaguer should represent an element of hope and confidence in the aid of Providence in Colombia’s great fight against the guerrillas. It shows that the Virgin will not abandon those who believe and confide in her. 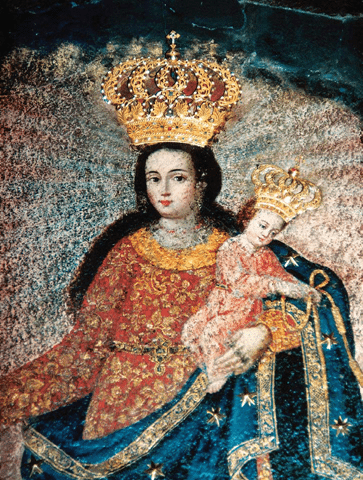 This entry was posted in About Our Lady and tagged attack, Catholic, Church, communist, faith, guerrillas, In Colombia: The “Miracle” of Almaguer Revives Hopes, Las Lajas, miracle, peace, Providence, Virgin by TFP.org. Bookmark the permalink.